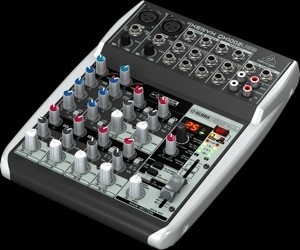 Just ordered a Behringer QX1002USB Mixer from zZounds for 109.99. My primary use for this mixer will be on solo acoustic guitar gigs where I only will use 1 mic and the RMC pickups, as well as backing tracks and maybe a guitar synth. I will use the mixer with either 2 QSC K10 or 1-2 Behringer Eurolive B210D speakers. This should allow me to play where I don’t have much room to set up and should be able to set up and start playing in 5-10min. NOTE: This mixer died in about one week. I sent it back and decided to go with a Mackie 802 VLZ4 mixer.